Four New Webinars. Check them out!!! ***Best Behavior Cocktails (for your client animals, not you! lol)*** 5 Low Stress Handling® Techniques for Cats*** 5 Low Stress Handling® Techniques for Dogs*** Low Stress Handling® in Emergency Care***Click here for more info. April 21st - 27th save 25% off of the Nerdbook, the Low Stress Handling® book, and the Low Stress Handling® bundle. You also get the Loaded USB stick free! All this with free shipping included. Click the ad to go to the store. 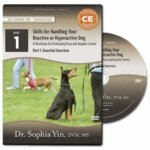 Understand how every interaction – how you approach, pick animals up, move them from place to place, or restrain them – affects the animal’s perception of you and their willingness to cooperate. Learn how to position your body and adjust your movement to provide the direction and guidance the animal needs.Why should you become certified?